If you want to participate in your community and be heard, you will need to speak out in some way. While this is important for all members of the community, to date, the approximately one-half of the population identified as female has been significantly often less heard than the half that is identified as male. With less than a quarter of media presenters being female, and men outnumbering women in parliaments worldwide by three to one, women’s voices are not being heard on an equal basis. To dismiss this as women not being interested is simplistic and inaccurate. In other domains, too, women are either underrepresented, or not catered for. In audiences, in education, in sport broadcasts, in managerial positions, the list is almost endless. And from childhood, girls are presented with gendered roles which suggest that cuteness and submissiveness are more desirable in a girl than ‘masculine’ traits such as independence and strength. Speaking Out: A 21st-Century Handbook for Women and Girls aims to help women and girls to be heard – on the stage, online, and in day to day life. From demonstrating how it is that women are both underrepresented and actively discouraged from changing this, to giving practical advice on how to speak in a variety of forums, how to research and write content and how to deal with criticism, this book is a valuable tool for women of all ages and should be essential reading in secondary schools. Tara Moss is an author, feminist and advocate for women with mover 20 years experience in the public eye. Her words are both practical and passionate, with examples and accessible explanations. A handbook for every woman. There must have been times in Tess Payne’s life in Victoria’s remote mountain country when she paused, did a double-take and wondered how she got there. A comment by an acquaintance about Aussie women living as pioneering once did led to Anne Crawford researching and writing a book about such women. She set out to find – and speak to – women living in remote parts of Australia and working hard to make lives for themselves and their families. 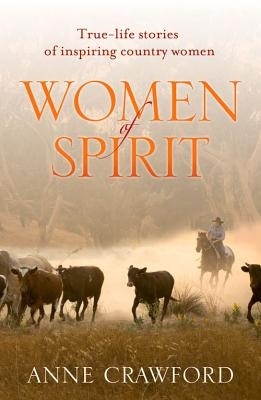 From Tess Payne, a city woman, who moved bush to support her husband’s dream, to Lee-Anne Bright who grew up on a remote property and then built a career governessing, and Emmie Wehr who raised her daughters single-handedly while also forging a career as a horse trainer, Women of Spirit is a testament to women who have endured personal trials, illnesses, and the extremes of Australia’s climate and landscape to do what they do. Crawford tells their stories with a sensitive touch, weaving the stories so that readers have an opportunity to know what shapes each woman, as well as what it is she has achieved.